How does your state measure up in the fight against cancer? Our annual report – now in its 16th year – shows where each state stands on critical issues effecting cancer patients and survivors. We are closer than ever to a world that is free from the pain and suffering caused by cancer. To accomplish this goal, we need to focus on preventing new cases of cancer, seeking innovative cures and treatments and ensuring that all cancer patients have access to the lifesaving medical care they need. State legislators play a critical role in this fight. 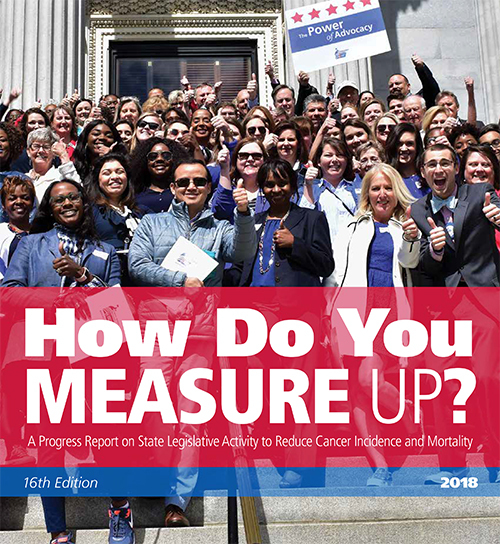 Laws passed at the state and local level help to improve the lives of patients and survivors and, along with the work of the American Cancer Society Cancer Action Network, play a critical role in the fight against cancer.